> The Nashville Predators announced today that they have re-signed former RedHawks captain Ryan Jones. The deal is a two-year, one-way contract that will pay Jones roughly $975,000 per season. In 46 games with Nashville last season, Jones registered seven goals and ten assists. 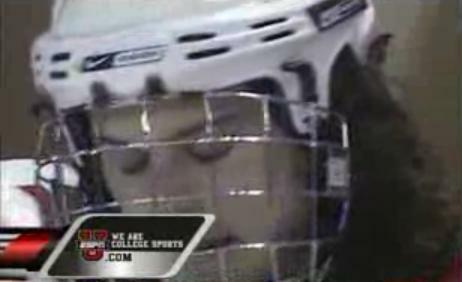 His first NHL goal came on October 15, 2008 against Dallas and CCHA alum Marty Turco. The key to this deal is that it’s a one-way contract. Jones had rejected his qualifying offer from the Predators earlier in the summer, reportedly because the team was offering a two-way contract. Having a one-way deal greatly limits the team’s options with a player, as they (the player) will be exposed to waivers upon being sent down to, or recalled from the AHL. This almost assures that Jones will remain with the Predators for the next two seasons, but where he’ll play is still in question. Conventional wisdom says Jonesy would be a great fit on the Preds second line, however, with Nashville’s rumored interest in several free agent wingers, exactly where he’ll fit in remains in question. To see what Ryan has been up to this summer, click here to see a Summer Snapshot feature and see the once again “clean cut” look that Jones is sporting. For those within the RedHawk community, you won’t be surprised to see where his hair went yet again. > Ryan Jones needs no introduction. Those in the Miami community know who he is, what he’s done, and where his career is heading. I recently had the chance to find out a little more about his career in professional hockey, his thoughts on the Frozen four, and his reflection on Miami, straight from the man himself. Enjoy. AM: What went through your mind when you found out you were being traded to Nashville? Had Minnesota given you any indication of where you’d be playing this season and what was your reception like within the Predators organization when you arrived? AM: Talk a little about how life in professional hockey differs from life as a collegiate hockey player. In addition, how does “game day” differ? AM: Living in Ohio and being an admitted Blue Jackets fan, I don’t get to see many Predator games on TV. I know that a large part of your game is camping in front of the net and driving to it to try and create offense. Has the Predators system/your role on a line/Coach (Barry) Trotz allowed you to focus on doing this? Would you consider your game in the NHL to be similar to the game you played as a RedHawk? AM: We all know the story of why you chose to grow your hair long…because of Korinne Croghan and Locks of Love. In her passing, how have you been affected and how did Korinne’s fight inspire you, on a personal level? AM: With it being tournament time, here’s a two-part question: Watching the Boston College game last year, I remember you were shown leaving the bench after the Eagles had scored the game winner in overtime. What was that moment like for you, knowing your Miami career had come to an end? AM: Second part: you said after that game, in the press conference, that you’d be the first alum to call once the program made the Frozen Four. I know that after several attempts, you did in fact manage to reach Coach Blasi. Explain the feeling you had when you found out that Miami beat Minnesota-Duluth to advance. AM: To me, you are a large part of what “The Brotherhood” is about and in my opinion, a perfect example of what a captain should be. What do you personally feel that you’ve done to better the Miami hockey program? I could list about 1,000 things and am sure others could too, but what does Ryan Jones feel that he’s done? AM: Put your rookie season, thus far, into perspective. Explain how it has played out vs. your initial expectations. Were you at all…”starstruck,” more or less, to playing with/against guys that you maybe had watched throughout your years in college and before? AM: One of the highlights of this rookie season was your first NHL goal, which you scored against Marty Turco, another CCHA guy, from Michigan. Explain that moment. AM: I’m very curious to know what type of rookie hazing you’ve been subjected to? AM: Inquiring minds were wondering: Is there any significance as to why you wear the number “10” in Milwaukee (which you also wore in Houston) and “28” in Nashville? I know Steve Sullivan has 26 occupied, for now. AM: Is there anyone you keep in contact with at Miami, or guys you’ve played with on past teams? Do you feel you’ll always follow the program in years to come and as I’m sure many will wonder, do you plan on going back to Oxford at all? AM: Closing thoughts? What advice would you give anyone considering making a commitment to play college hockey at Miami? > Sophomore forward Carter Camper has been named to the CCHA-All Conference squad. Camper, on the first team, is the only Miami representative to be named. Others receiving votes from Miami were Pat Cannone, Justin Mercier, Kevin Roeder, and Chris Wideman. In his second season with the RedHawks, Camper has 19 goals and 19 assists, for a career total of 79 points and is most assuredly on his way to the 100-point club, with two years of eligibility remaining. – The latest edition of Inside the CCHA features this a preview of this weekend’s quarterfinal matchups. 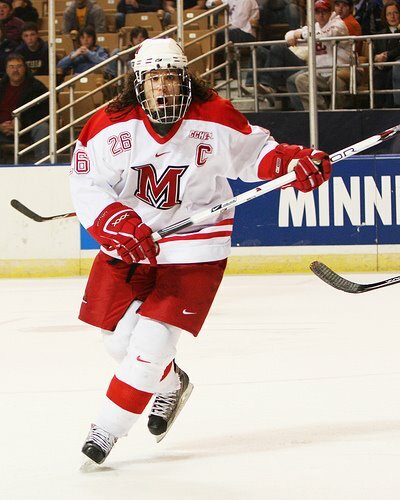 Among their guests this week…none other than former RedHawk captain and current Nashville Predator, Ryan Jones! Click Here to Listen. -Here are some game notes with stats and previews for this weekend’s series against Northern Michigan. MURedHawks.com will also feature a live game day blog, beginning on Friday. Northern Michigan comes into the second round of the tournament fresh off a weekend sweep of Michigan State (5-3, 8-2). The Wildcats are unbeaten in their last six games and since the calendar turned to 2009 Northern Michigan holds one of the best records in the nation at 13-3-2. No team in the CCHA has won more games in the New Year and only No. 1 ranked Boston University has more wins nationally (16). Northern Michigan has also played one of the toughest ’09 schedules as they have had six road games against ranked opponents. The Wildcats are led by a trio of young scores in Gregor Hanson, Mark Olver and Erik Gustafsson. All three have 30 points or more and hold a +14 or better (on the season). Of the three only Olver was able to record a point on the Wildcats last trip to Oxford. The Wildcats earned a win and a tie (shootout loss) on its trip to Steve Cady Arena on Feb. 20-21. The RedHawks outshot the Wildcats 91-27 on the weekend including holding Northern Michigan to seven shots on goal on Feb. 21. It was the first time in school history Miami held an opponent under 10 shots in a game. Miami holds a record of 14-29-3 in the all-time series with the RedHawks leading 9-8-2 in games played in Oxford. – Carter Camper picked up an assist in the Feb. 27 game against Ohio State and ended his second regular season with the RedHawks having never been held pointless in a CCHA series in which he has played in both games. Camper has kept the streak going with goals in seven of his last eight CCHA series. – Miami holds an all-time record of 21-31 in the CCHA tournament and a 16-8 record in Oxford. Miami has won six of its last 10 CCHA tournament games and been in the CCHA title game in two of the past three seasons. – The RedHawks lead the nation in the penalty kill with a 91.1-percent (185/203) success rate. No other team in nation is better than 90 percent. – Connor Knap and Chris Wideman were both named to the CCHA all-rookie team this week becoming the first pair of RedHawks named to the first team since Matt Christie and Marty Guerin in 2003-04. – Miami has not lost a CCHA second-round home series since being swept by Lake Superior State University in 2007. The sweep by the Lakers is also the last time Miami has been swept in a home series. – Justin Mercier became the first player in Miami history with 100 wins and 100 points when he scored an empty-net goal against Ohio State on Feb. 28. It was the second time the senior had found the net in the game and the first multi-goal game of the season for the Erie, Pa. native. – Brian Kaufman has scored three goals in his last two games including his first multi-goal game of the season against Ohio State Feb. 28. 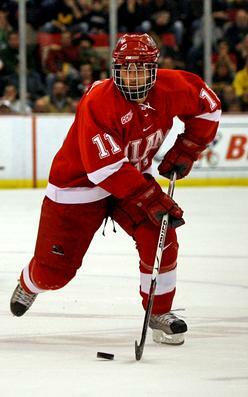 – Bill Loupee comes into the CCHA playoff having played 99 career games for the Red and White. The RedHawk special teams units are currently rated the best in the CCHA. Miami leads the conference and the nation on the penalty kill with a unit that is successful on 91.1 percent (185/203) of power plays by opposing teams. The RedHawks also have a solid power-play unit that is currently ranked second in the CCHA with a 19.5-percent (41/210) success rate. Miami has two of the top three power-play point-scorers in the CCHA this season in Carter Camper and Pat Cannone. Camper is tied for first in the conference with 22 points (11-11-22) with the man advantage and Cannone is tied for second with 21 (5-16-21). This season, Miami is 12-6-4 when it scores on the power play, 9-6-2 when it is perfect on the penalty kill and 7-3-2 when it does both in the same game. Miami is currently ranked eighth in the USCHO and CBS College Sports Division I men’s hockey poll. The RedHawks have moved up and down in the Top 10 this season but have been ranked within the nation’s Top 10 for 46 consecutive weeks. During this run, the RedHawks have been ranked as the nation’s No. 1 team for ten weeks. Miami has also been ranked in the Top 10 for 81 of the last 89 weeks and has been ranked No. 1 11 times. This season, Miami has played 10 games against ranked opponents and holds an overall record of 6-3-1, boasting two shutouts (Notre Dame – Oct. 24, Michigan – Nov. 21), both by freshman Cody Reichard. Wildcats Fact: Northern Michigan has as much success as anyone at Steve Cady Arena this year, taking three points on the weekend while goaltender Brian Stewart made 89 saves in the two games. Redhawks Fact: With this weekend’s games, Miami has hosted a home playoff series in each of the three seasons the new rink has been open – the RedHawks are 1-1 in the two previous series, losing to Lake Superior two years ago and knocking off Bowling Green last year. How NMU Wins: The Wildcats need to ride all of the momentum that they’ve built throughout the second half, spreading the puck around evenly as five players enter the weekend with four-game point streaks. How Miami Wins: The RedHawks are fortunate to have some experienced and hungry players looking for an elusive first CCHA playoff championship for the program. They will, however, go only as far as Connor Knapp and Cody Reichard take them. – MURedHawks.com has posted this morning’s online chat with seniors Kevin Roeder and Brian Kaufman here. I’m sure the boys liked the questions received from a few “fans,” namely Ryan in Nashville and Jeff in Ontario! – Finally today, news that the Bowling Green hockey program may be in jeopardy due to the school’s 10 million budget shortfall. You can read the article, courtesy of College Hockey News, at this link. Ryan Jones has been recalled by the Nashville Predators…again. Hey, at least the Frequent Flyer Miles will pay off eventually, right? The Predators visit Western Canada beginning Wednesday night, with games against Vancouver, Calgary, and Edmonton. >For those that don’t know, Ryan Jones was recalled today from Milwaukee and scored his fourth NHL goal for the Nashville Predators in a 2-1 Colorado win tonight. 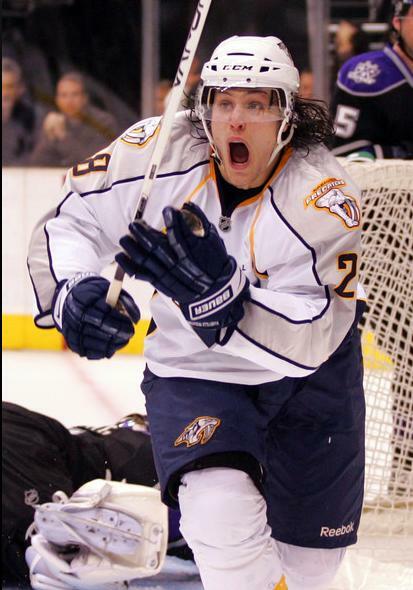 > Nashville Predators President of Hockey Operations/General Manager David Poile announced today that the club has recalled forward Ryan Jones from the Milwaukee Admirals of the American Hockey League. Jones, who started the season with Nashville and has six points (3g-3a) in 15 games with the Predators this season, was reassigned to the Admirals on November 20. The 6-2, 215-pound forward has posted nine points (6g-3a) and a +4 rating in eight games with Milwaukee. Jonesy will be in the lineup tonight against Columbus (TV: FSN-Ohio). 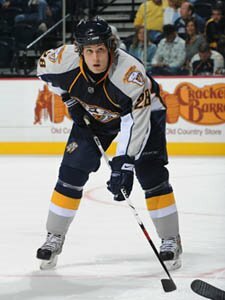 COLUMBUS, Ohio – It will be Round Two for Ryan Jones when the Predators play host to the Columbus Blue Jackets tonight. Jones began the season on the NHL level, but was reassigned to Milwaukee of the American Hockey League about three weeks ago – along with fellow rookie forward Patric Hornqvist. He’ll be wearing the Predators jersey once again tonight, as Jones was recalled this morning because of injuries to Jordin Tootoo and Scott Nichol. 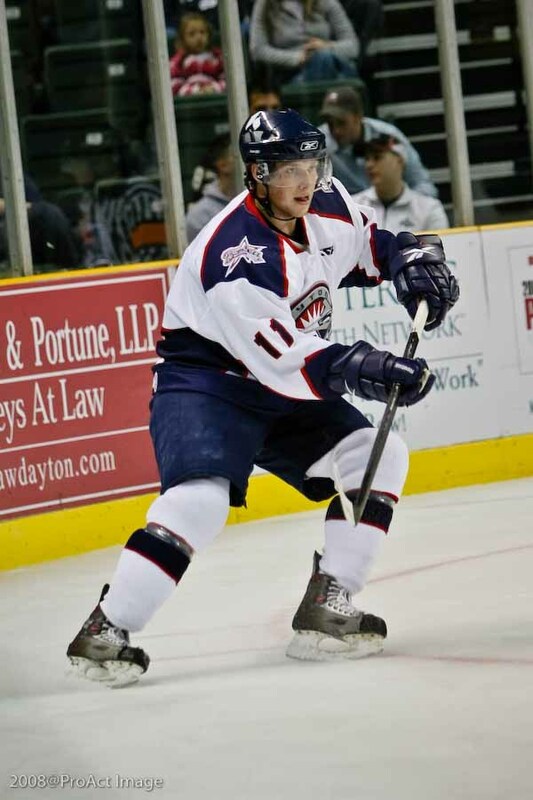 The 6-2, 215-pound forward had posted nine points (six goals, three assists) and a plus-four rating in eight games with the Admirals. 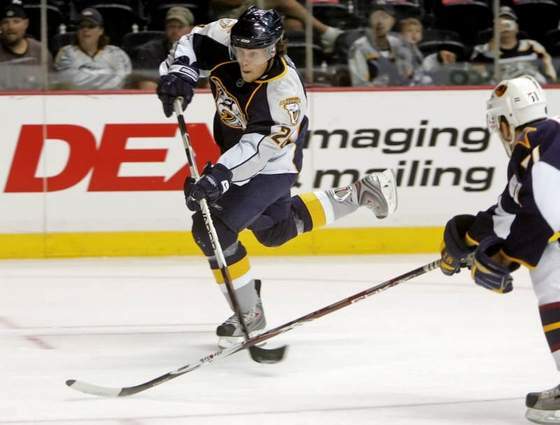 “He’s been playing very well in Milwaukee,’’ Preds coach Barry Trotz said. Jones said he feels the experience gained at the AHL level has benefited him.